Ever since my aunt gave me a brand new sewing machine a couple of weeks ago, i have been bitten by the sewing bug. I did think that having the sewing machine was handy so that I could sew another teething rail cover for Ollie. That was before I started checking out sewing patterns for bags after a friend said I should sew a bag for an iPad. Oohhhh bad mistake to checking that out. One thing led to another and I was checking out more homemade bags and shoes! Infant, toddler shoes. The shoes looked sooooo adorable. Argh. Suddenly I could not get enough of sewing. Having the machine was so convenient. I bought material from Daiso and got started. Haha. I have to say it’s so addictive! 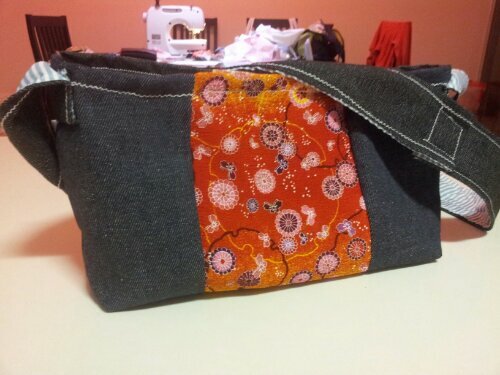 So far I have sewed some simple bags; a lunch bag, a tote bag and a sling bag. They have been fun projects! Gonna be exploring a few other types of bags and try with some new fabric I got from Melaka. Next up probably a new diaper bag and some shoes for some babies & Ollie!